Home > Products > Face > NoLines Organic Eye Serum with Resveratrol, Acmella, Beech Tree, Hyaluronic Acid. NoLines Organic Eye Serum is super concentrated with patented technologies designed to address the most visible signs of aging, like: fine lines and wrinkles, expression lines, sagging skin, loss of elasticity, dullness, dark circles, and puffiness. This amazing serum rapidly and effectively revitalizes your skin with incredible anti-aging benefits for instant and cumulative results. Infused with organic antioxidants, vitamins, organic herbs, natural peptides, EFA, Hyaluronic Acid, and PCA. Give your eyes a bright, luminous glow revealing smooth, youthful-looking skin while intensively hydrating the delicate area around your eyes. Specially formulated with light diffusing NoLines Illusion organic blend that deflects light away from the eye wrinkles, making the wrinkles disappear while working to repair, restore and revitalize your skin naturally. Works like magic! Give your eyes a bright, luminous glow while giving your skin a rejuvenating boost. PLUS 15 ORGANIC EXTRACTS Improve micro-circulation, reduces puffiness and gently evens out skin tone. Organic Aloe Vera Juice, Organic Grapeseed Oil, Organic Rosehip Oil, Organic Inca Inchi Oil, Organic Borage Oil, Organic Squalane, Organic Shea Butter, Organic Coconut Oil, Food Grade Emulsifier, Organic Glycerin, Xanthan Gum, Rose Extract, Resveratrol, Acmellia, Acai Berry, Amla, CoQ10, Hyaluronic Acid, Green Tea, Beta Glucan, Organic Oat Extract, Alpha Bisolobol, Licorice Extract, d-Panthenol, Vitamins C and E, Beech Tree, EO Blend. Step 1. Cleanse your face with your favorite Essona Organics cleanser or scrub. Step 2. Spray your favirite Essona Organics Tonique. Step 3. Apply NoLines Organic Face Serum. Step 4. Apply NoLines Organic Eye Serum. Step 5. Finish with an Essona Organics Moisturizer or Creme. For Anti-aging, use WineRose Moisturizer. For Lifting, use Ancient Secret 24/7 Lift Creme. For best results, gently dab a very small amount morning and evening around the eye area in conjunction with a complete Essona Organics skin care regimen. Can be used on smile lines and on your neck. Say goodbye to Puffiness, Wrinkles, Dark Circles and say Hello to bright, dazzling eyes! NoLines Duo Anti-aging System addresses major skin care concerns with proven results. 90% of women saw more radiant, energized, supple and vibrant skin. 95% of women saw a dramatic improvement in their skin's overall appearance after just 4 weeks. 89% of women saw improvement in radiance and brightness. 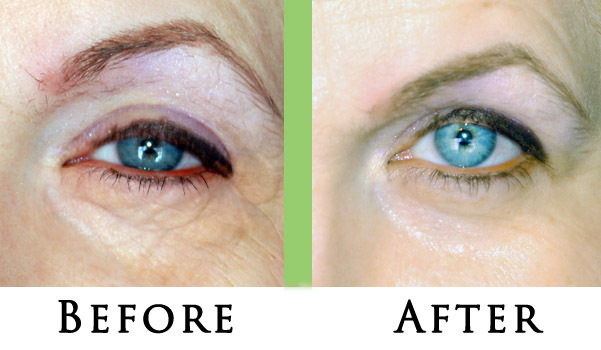 85% of women saw a reduction of eye bags and dark circles. 77% of women saw improvement in skin tone and firmness. 87% of women saw a visible reduction in appearance of fine lines and wrinkles. Amazing Anti-Wrinkle Effects - Lifting, Brighten, Plump, Quench. Diminish Crows Feet, Eye Bags, Fine Lines. Instant tightening to reduce the appearance of fine lines and wrinkles. Patented light diffusing NoLines Illusion organic blend that deflects light away from any eye wrinkles. Plump your skin to reduce wrinkle size. Organic oils sooth and strengthen fragile skin around your eyes. Powerful antioxidants fight free radical damage. Protects your skin from pollution damage. Contains Natural Peptides, Hyaluronic Acid, CoQ10, 15 Organic Extracts, Antioxidants. Its the Secret of the Rich and Famous!